Masada tours are a must for anyone visiting Israel, and an easy trip from Jerusalem – just about an hour’s drive southeast. Masada’s archaeological remains bring alive its 70-70 CE inhabitants’ intriguing tale. A symbol of steadfast strength to preserve national and religious identity and homeland, Masada is so replete with history that Israel invests in it as an official national park, and UNESCO declared it a World Heritage Site in 2001. In addition, Masada is a high hilltop plateau offering unmatched, vast views of the Dead Sea and Judean Desert. For all these reasons, Masada tours are extremely popular. At just over an hour away from Jerusalem, Masada is an easy trip to include when planning your Jerusalem tours. If you’re not on an organized Masada tour, you can get to Masada on your own via direct Egged bus, car rental, or cab. Read more about traveling from Jerusalem to the Masada and the Dead Sea. In addition to being rich archaeological site that offers a window into the history of the region, Masada is also a beautiful natural wonder in the middle of the desert. Many Israelis and active tourists come just as much for the enchanting morning hike up Masada as they do for the site itself. Most tourists get to the top of Masada via the cable car. These hi-tech, Israeli-engineered cable cars were upgraded for the expected increase in tourism for the year 2000 and are an attraction on their own. If you’re up for the hike, it’s essential to get to Masada early in the day – otherwise, blistering temperatures can make the hike difficult and even dangerous. The trails open at 5:30 am, and most people hike up the Snake’s Path, which takes an average 40 minutes, but there are also steps. When you reach the peak of this mountain fortress, you’ll be able to gaze at the pink-orange-yellow horizon over the Dead Sea and Judean Hills, surrounded by dusk’s cool newness in the air. So, if you’re inclined for the hiking challenge, take this rare opportunity to catch a breathtaking sunrise and the amazing views from Masada. Once you reach the top either by cable car or hike, at the entrance you’ll receive a site map, good for both self-guided and organized tours. You’ll walk around, site by site, amidst the remains of daily life of the small – albeit strong – group of zealous Jews who held fast for three years against the conquesting Roman legions. 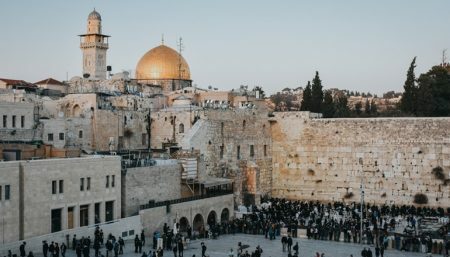 Theirs was the last battle, in 73 CE, three years after the Romans destroyed the Jewish Second Temple, resulting in the Jewish Diaspora, splintering Jews to many corners of the earth, longing all the while to return to their homeland. In modern times, Israeli pioneers took to Masada as inspiration for defending the Jewish nation, saying, “Masada will not fall again.” The twist is that the group of people under Roman threat took their own lives in the end, leaving the question about martyrdom’s value, both two millenia ago and now. Several sites have been semi-reconstructed by expert archaeologists, with lines painted on the stones to distinguish the interpretive add-ons. From cooking facilities to ritual baths, synagogues to seating areas, you’ll sense what life was like for this sequestered holdout almost 2000 years ago. Another attraction on Masada is the Torah writer (“sofer”), whom you can see caligraphying letter by sacred letter, day in, day out. The refurbished Masada complex houses the Masada Museum, in tribute to the leading Israeli archaeologist, Yigael Yadin, for his spearheading work on Masada and other contributions to Israeli history. The museum’s displays include engraved names (perhaps as part of a martyrdom lottery), braided hair, and other telling finds. Given its glorious view and history, Masada is the site for both public and private events. Many public music concerts take place at Masada, including philharmonic, opera, and popular singers like David Broza. Private engagements such as weddings, bar mitzvahs, and even business conferences can be arranged with Masada event planners at +972-3-539-6700. Whether you’re traveling alone, in a group or on an organized tour, here are some practical tips that will ensure you have a pleasant visit to Masada. There are fees for both entrance to the park and the cable car. An all inclusive ticket with entry and round-trip cable car is about 75 NIS, and half-price for children. Entrance to the park alone is 20 NIS for adults. Group discounts are available. You can also skip the line and buy a Masada ticket package with cable car, entrance to private Dead Sea beach and lunch at Masada Restaurant. Interested? Bring a brimmed hat, food, and at least 2 liters of water per person. The nicely designed Masada mall offers an array of popular eateries and shops at the foot of Masada, but atop the mountain itself, shade and refreshments are scarce. If you come with children, it’s best to have an engaging, entertaining tour. There are also plenty of climbing opportunities at some of the site stations.